Want to know four easy online ways you can generate Facebook Likes without sweating? These tactics are like putting your Likes on autopilot because once you apply these tactics you don't have to worry about checking back on them. These are considered easy things you can do to get started with increasing your Likes because they don't require a lot of time nor are they a hassle to do. See for yourself! Have you built a sizeable network on LinkedIn, gained a strong following on Twitter, Google+, or Pinterest, etc...? Make sure you place a link to your Facebook page on your other social network profiles to let followers and profile viewers know. If others are following you on Twitter, Pinterest, or LinkedIn, they most likely will follow you on Facebook. Get the social plugins Facebook offers on their website and immediately integrate them on your website. You can also install the following plugins: Like Button, Send Button, Subscribe Button, Comments, Activity Feed, Recommendations Box, Registration, and Facepile. To learn more about what each plugin does individually, visit Facebook's social plugins page for more information. Of course you have friends who support you and your business. Why not ask them to Like your page? You are sure to generate Facebook Likes by doing this. 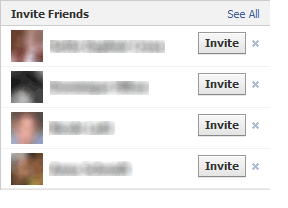 Use the "Invite Friends" box (seen below), to do this step. It's found in the bottom-right corner of the Admin Panel on your page. Put a simple link in the signature of your email so that all those whom you communicate with via email are one click away from Liking your page. 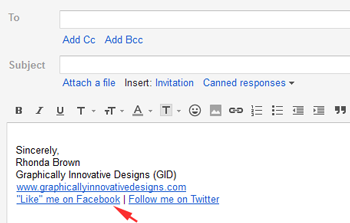 This is how I link to my Facebook page in the email signature.